Leading up to Earth Day, the New York Times ran an editorial, “Time Is Running Out,” lamenting the lack of urgency in the United States to prevent a very urgent problem: catastrophic climate change. Recently, Brad Plumer at Vox explained why it may be too late to keep average temperatures from rising more than 2 degrees Celsius above preindustrial levels — the threshold that climate scientists have been warning about. There are many steps we’ll have to take to drastically reduce greenhouse gas emissions. But one of them is most definitely this: America has to stop spending billions on projects like Wisconsin’s Zoo Interchange and start getting serious about building places where people can get around by walking, biking, and taking transit. This single highway interchange, aimed at reducing delays for suburban car commuters in the nation’s 30th largest city, costs more than total federal spending on walking and biking annually. The Zoo Interchange carries 300,000 cars per day. It is “Wisconsin’s oldest and busiest interchange,” according to the state. A big part of Wisconsin DOT’s justification for the Milwaukee interchange is “safety.” According to WisDOT, there were an average of 2.5 collisions a day on the interchange between 2000 and 2005, and nine were fatal. By comparison, according to the 2009 National Household Travel Survey, Americans make about 112 million walking trips daily. About 4,000 pedestrians are killed annually on American roads. And yet, Wisconsin will spend more on this one sprawl-inducing highway project than the feds spend each year on all walking and biking projects combined. Clearly, our priorities are out of whack — way out of whack. Total federal spending for biking and walking amounts to about $2.61 per capita. If the pricetag of the Zoo Interchange were divided by every man, woman, and child in the United States, the cost would be $5.39. It’s important to note that state and local funds will pay for most of this project. Still, our sources tell us that Zoo Interchange planners hope to get 20 percent of the cost from the federal government, or $344 million. Meanwhile, advocates fought tirelessly to protect $822 million in funding for biking and walking in the last federal transportation bill. And here’s the sad fact. The Zoo Interchange isn’t all that special. It’s a very expensive interchange, but it belongs to the same club as Louisville’s $2.6 billion Ohio River Bridges project or Cleveland’s $300 million Opportunity Corridor. Almost every region of the country has a road project that appears just as dubious. We won’t succeed in the fight against climate change if we keep throwing billions of dollars down the sinkhole of car dependence and sprawl. Or maybe this shows that the federal government isn’t spending as much on biking and walking as they should. The zoo interchange is a necessity. It should not be stopped. While I’d favor additional investment in other transportation projects, I’m not sure that means the Zoo shouldn’t be rebuilt. I also have to take issue with the single-minded slant of this article attacking suburban commuters — no surprise on a website with “urban” in it’s title, but I, for one, drive the through the Zoo daily in the opposite direction and get stuck in plenty of traffic too. I own and am improving a home in the city near plenty of walkable and bikeable things that I both value and take advantage of. But my choice of employer and their (now 50 year old) choice to locate in northern Waukesha means I do have to use a car and go through the Zoo. You can’t right every wrong from 60 years of bad or non-existent urban planning and certainly “not fixing an interchange” isn’t going to help either. In many ways, roads have to catch up with what’s already here. Yes, some of that may induce additional growth, but that’s stagnated in general since 2004, so there are clearly other generational and societal forces at work. Capitalize on that and focus on making this the last time the Zoo is expanded. I did not see any arguments for actually stopping work on the interchange other then the obligatory “we must stop global warming!” rant. Anything substantive? Maybe an argument that blowing it up would somehow cause everyone to park their cars, abandon their suburban homes, and set up a tent city in the Menominee Valley where they can walk to the local blacksmith at which they work? Hey, it could happen! People have been driving less and less every year since 1996. People currently in their late teens and 20s drive less than any generation before them. Is it wise to keep spending hundreds of millions of dollars (or more) on highways year after year? While I agree with the sentiment in the article, I also agree with the first two comments — such a simplistic argument does not advance our understanding of the situation. The question is not either/or. If we want to change the way we think about getting around and how that effects the built world we must embrace the complexity of subject. Bottom line, doing nothing about the interchange, allowing traffic to worsen, and allowing infrastructure to break down probably wastes even more gas, and creates more emissions, with cars on the road longer at a standstill. All of the goods we buy in stores and many services get transported locally to places by the highways and roads, and this cannot be solved by mass transit. I think the folly here is the belief that everyone has jobs where they can simply get on a bus, bike, or train and arrive at a conveniently scheduled time. That’s simply not the case for much of the workforce. Just like it’s folly to think that everyone has an automobile to get them to a job anywhere in the region. Angie should have paid attention to the entire Zoo interchange conversation. Most plans for the rebuild included the expansion of the number of lanes. Gov. Walker and the Legislature did not allocate extra money for the project and instead we’re getting essentially a “rebuild as is.” The Zoo project also includes money to pave and rebuild bridges for the Hank Aaron State Trail, our newest BIKE TRAIL that serves primarily URBAN riders. I’m a fan of Streetsblog but if this typical of your coverage, it really makes me wonder about your reporting on projects I’m not familiar with. Expanding lanes is wasting money. Adding more lanes does not alleviate traffic. Marty, you don’t know what you’re talking about. They’re widening the Freeway to 8+ lanes. I say 8+ because at times the freeway swells to 10 lanes. All this for the 30th largest metro with the 44th worst traffic. Yep, we gold-plate our freeways in WI… the road builders pouring money into the GOP trough has nothing to do with it. There is a reason why roads tend to take priority over walking and biking projects – because most people do not have the luxury of living and working in the same vicinity – they need to drive to work. Letting the highways fall into disrepair will not change that fact. It will not encourage people to pick up a bike and ride 15+ miles to their job every day. I’d love to see more bike paths and walking paths. In fact, Milwaukee already has a pretty impressive network of paths, probably more so than most cities. Since Ms. Schmitt doesn’t live in the area, maybe she doesn’t realize that. Tim– I stand corrected on the number of lanes. The current plan does include more lanes, but not all the “bells and whistles” of earlier iterations that DOT wanted. This is definitely one of the less expensive options for the replacement of an intersection at the end of it’s design life. I would also like to add that the title of this story “Why the Zoo Interchange Project Should Be Stopped” is ludicrous. Stopped? Now? Really? This thing’s been in the works for 10 or more years. Contracts have been let. Work is going on everyday. And back to the Hank. The Zoo price tag includes at least 7 bridges over the bike trail. Bridges that would not be needed if the bike trail wasn’t there. So, in way, some of the money spent on this freeway project does support walking and biking. I too, am bike/ped advocate in my community. But we need to be realistic about our expectations. While I won’t complain in the least about bridges over or paving of the Hank Aaron Bike Trail that’s part of the Zoo project, do remember that it was a railroad corridor that was railbanked — Federal Law sort of ties DOT’s hands here, though no doubt in the people’s favor. Absent that status, the path might’ve been preserved through there, but likely not as a straight line, the same clearances and definitely with less substantial bridges or other accommodations if it weren’t a rail corridor. Let’s also make sure to draw a distinction between maintaining roads/highways we already have and building new ones/expanding existing ones. Adding lanes does not reduce traffic. And do we really need more roads/highways than we already have? There’s no way we need to spend as much money as we do on roads/highways year after year after year. The other big factual problem with this opinion (since that’s exactly what this “article” is) is that Angie Schmidt clearly does not bother to take into account all of the trucks that use the Zoo Interchange to haul goods around. 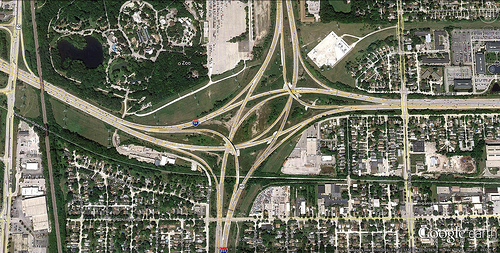 That interchange is part of the manufacturing lifeline of Milwaukee and beyond. Without it, manufacturers would have a harder time getting supplies and shipping products, and would quite possibly leave the area and take their jobs with them. This is something that our current Mayor, Trolley Tom Barrett, and others clearly do not understand. No jobs, no paychecks. Bike paths are a “nice to have”, jobs are a “need to have”. It is exactly that simple. I also was amused by PMD’s mindless responses. More lanes does alleviate traffice congestion, just like more water can flow through a bigger pipe. I would also like to see PMD bike or bus from Good Hope Rd to Oklahoma Ave for a day job, and then from there to Vliet St. for a second job without being late, and without being a sweaty mess that is not presentable for an office job. The bus and a bike (if one is even fit enough to make that kind of daily trip) take too long, and a bike is not at all feasible in the winter. On top of that, how do you get a week’s worth of groceries for several people home on a bike or a bus? Severe logic flaws here. When it comes to added lanes and spending money on freeway expansion I like to be as pragmatic as I can. I look at each situation and make my own personal evaluation of whether it’s worth my tax dollars or not. For example, adding lanes on I-94 from Racine to IL border seems like a complete waste… I’ve never heard of any congestion there unless an accident has taken place. Same for I-39 from Madison south. However, when it comes to the zoo interchange, years of daily backups without any accidents makes me think twice. It’s true that in general if you add lanes it will only temporary relieve congrestion, a few years or decades go by and it will build up again in most cases. However, I don’t believe the metro Milwaukee area is “most places.” Without any congestion, the travel time from Washington and Western Waukesha counties is already at the limit of what most commuters want to tolerate. At most we will see more fill in around our spawl areas… but I don’t see Milwaukee expanding that much more. More importantly though, many who support the urban lifestyle seem to assosciate things like congestion as a primer for having a vibrant city. This is the same case for parking. However, both of these are side effects of a vibrant city, not causes. You can’t artificially create or fight these things, you need to build a city that people want to live/work/play in and then you deal with parking and traffic afterwards. In the mean time, if you allow congestion (or as I mentioned, restrict available parking), you will turn off more people who live in the burbs, and will always live in the burbs, from wanting to travel downtown. This is counter to what we are trying to accomplish in having a vibrant city. It’s my belief that if we continue to build a city that people want to be a part of, they will move closer to the city, find jobs in the city, or come enjoy the entertainment in the city. We can’t force people to do it against their will. But if they choose it of their own accord, then we’ll have a lot more people enthusiastically embracing what most of us here already love. Across the Atlantic, the British government reached a similar conclusion. Its studies showed that increased traffic capacity causes people to drive more–a lot more–such that half of any driving-time savings generated by new roadways are lost in the short run. In the long run, potentially all savings are expected to be lost. In the words of the Transport Minister, “The fact of the matter is that we cannot tackle our traffic problems by building more roads. he main problem with traffic studies is that they almost never consider the phenomenon of induced demand. Induced demand is the name for what happens when increasing the supply of roadways lowers the time cost of driving, causing more people to drive, and obliterating any reductions in congestion. Also, it’s true that a bike isn’t much good in winter, or for transporting a significant amount of groceries, or for getting you to a job many miles away. I never suggested otherwise. But what if you don’t have a car? Based on comments, it seems that many people posting here don’t know many (if any) adults without a car. I do. Try getting to work when it is many miles away and you need to take 2 or 3 buses to get there (and then 2 or 3 more to get home again). That’s great Dave. Share that with Jon. The Zoo handles necessary high volume traffic that would otherwise flow through the Marquette. It’s critical to allow all types of vehicles the safest means to travel around Milwaukee. The Zoo updates will provide that (with a design that will endure). This “blogarticle” could serve, rather poorly, as a general template to dispute any major road work. If we were talking about the 794/Hoan Bridge, it would make sense to offer protest to promote the integration of pedestrian friendly infrastructure while limiting traffic lanes. Let’s focus on improving the urban core and it’s neighborhoods where there actually is year-round pedestrian activity. I’m going to start walking from Milwaukee to Madison now. Maybe by the time I get there the arguments contained in this article will make sense to me. a freeway along what is now Brown Deer Road to 45. Angie, please focus on Cleveland, and write back in a few years when you have some objective benchmark of success for your ‘ideas’. Hey Angie, here, the writer. This article was written for a national audience. Actually, I know a fair amount about the Zoo Interchange. The idea that people couldn’t drive to work if Wisconsin didn’t spend $1.7 billion on the Zoo Interchange is nonsense. WisDOT itself examined, and abandoned, less expensive alternatives. The point is, the costs of this project are way out of proportion with the benefits. We as a nation can’t muster this much money a year for walking and biking trips nationally — 11 percent of total trips by all Americans. The idea is to put this amount of spending in perspective. If you do that, it looks like an INSANE expenditure, and it is. There is absolutely no way this is going to pump more than $1.7 billion in new money into your economy, or into the American economy more broadly. If a $1.7 billion expenditure on a single interchange is what you need to prevent your local economy from collapsing I would suggest that is a problem this region really ought to devote a fraction of these resources to remedying. Here’s an example of what I am trying to point out, how crazy this project is. Safety is being used as a justification for this project. There were 2.5 fatalities in 5 years. So over 30 years, we could guess there would be 15. Even if this project entirely eliminated fatalities — it won’t — the cost to Wisconsinites would be $113 million per fatality prevented. Wisconsin can’t sustain that kind of investment in safety. Nobody can. If that seems like a reasonable expenditure to you guys, I don’t know what to tell you. There are better, cheaper ways to move people than this. I know your land use is screwed up. But this won’t help, it will make it worse. By the way, I didn’t write the headline that says this project should be stopped. That was the editor of this site. I said America needs less projects like this one. It’s a really, really expensive project and it’s a really lousy one too. I like how the author Angie feels the need to put the word “safety” in quotations, as if there aren’t any legitimate safety concerns. The interchange is obsolete and deteriorating. Inspections have revealed corrosion, cracks, and even concrete falling onto the roadway. These are not simple repairs that you can just patch up and hope it lasts another 40 years. From an urban planning viewpoint, I can understand how a reconstruction of the interchange might not be needed, but from a civil engineering standpoint, it is most definitely needed to protect the safety of motorists and state/inter-state commerce. One of the other projects Angie mentions, the Ohio River Bridges project, is also a very old interchange and is deteriorating quickly as well. Interestingly, Urban Milwaukee and StreetsBlog say that people are driving less, yet StreetsBlog says that other drivers will fill the void and congestion will not be reduced. So which is it? Are people driving less because they’re less car-dependent and want transportation options, or is it because we don’t have enough lanes and people don’t want to sit idle in traffic? The title for this article is in poor journalistic taste; “Why the Zoo Interchange Project Should Be Stopped” but doesn’t really answer the question of why aside from briefly alluding to climate change. Even if the United States hypothetically eliminated all carbon emissions, it would be quickly offset by other developing countries who have no interest in slowing the growth of their economy to entertain the idea that humans over the course of a couple hundred years are destroying the climate. A quick glance at the Vostok ice core samples show that there are big variations in global temperature and CO2 levels over hundreds of thousands of years and we’re due for a warming period.